In recent years, organizations have increasingly turned to advanced software solutions to manage workloads, maintain profitability and ensure competitiveness within their respective industries. While there are several options available, business intelligence tools (BI) and business analytics tools (BA) are arguably the most widely implemented data management solutions. Business analysts and software buyers alike often ask what are the key differences between business intelligence vs business analytics. Business intelligence solutions are among the most valuable data management tools available. BI solutions collect and analyze current, actionable data with the purpose of providing insights into improving business operations. Are you looking for ways to better understand your business operations? What about discover pain points in your workflows? How about analyze big data sets to draw valuable insights? You need a business intelligence solution. Business analytics software is either a child or parent (depending on who you ask) of the business intelligence category. Like BI, it is primarily used to analyze historical data, but with the intention of predicting business trends. It also usually has an eye toward improvement and preparation for change. In broad terms, business intelligence systems are used to maintain, optimize and streamline current operations. The term refers to technologies, applications and practices for the collection, integration, analysis and presentation of business information. The purpose of business intelligence is to support data-driven business decision making. Business intelligence is sometimes used interchangeably with briefing books, report and query tools, and executive information systems. BI improves and maintains operational efficiency and helps companies increase organizational productivity. Business intelligence software offers many benefits, including powerful reporting and data analytics capabilities. Using BI’s rich data visualization mechanisms like real-time dashboards, managers can generate intuitive, readable reports that contain relevant, actionable data. So BI offers reporting and analytics — isn’t that just two words for the same thing? Many people both in and outside the software industry incorrectly use reporting and analytics interchangeably, which is one cause for the confusion behind the BA/BI conflation. Reporting is “the process of organizing data into informational summaries in order to monitor how different areas of a business are performing.” It gathers data and delivers it in a digestible format. Analytics is “the process of exploring data and reports in order to extract meaningful insights, which can be used to better understand and improve business performance.” This function takes the “what” of the data given by reporting and draws conclusions and insights, offering users a “why” and “how.” Basically, reporting functions present data, and analytics features interpret data. Both are crucial features and will typically be offered by both BA and BI solutions. Additionally, business intelligence tools can analyze financial and operational statistics, identify weak areas and provide ways to address these issues. The trends found through data analysis help companies make better-informed, data-driven decisions. Other common BI features include data visualizations, decision services, integrations and online analytical processing (OLAP). Data visualizations serve a purpose similar to reporting. Both features function as a tool for the organization and presentation of data. Visualizations amplify reporting functions by offering data representations in an easy-to-interpret medium. Decision services narrow the focus of business intelligence to financial reporting, with many systems offering built-in compliance measures and fraud detection. Integration capabilities ensure a business intelligence system can work seamlessly with currently-in-place tools. Furthermore, integration features help pull data from multiple sources, from in-house databases to more complex Big Data centers. Many BI tools employ online analytical processing (OLAP) to perform sophisticated, multi-dimensional, drill-down analysis. In addition, BI offers a goal management function. Managers are able to program data based on goals, which may include sales goals, productivity measures or financial objectives, on a daily basis. BI features contribute to the goal of providing an awareness of current business practices. An example of a Dundas BI dashboard, complete with data visualizations. Popular business intelligence solutions include: QlikView, SAP BusinessObjects, Mircrosoft Power BI, IBM Cognos and Microstrategy. To see a comparison of top BI software, get the SelectHub BI Analyst Report. When considering the virtues of business intelligence software and the ways it differs from business analytics, it is important to acknowledge the function of BI as an evaluator of the past and present. It is used to make improvements right now. Business intelligence systems examine data on performance, finances, media reach and more, and report the information in a format that can be interpreted in a useful way. With the insights provided by business intelligence software, organizations can use their data to improve current processes. Like business intelligence, BA collects and analyzes data, employs predictive analytics, and generates richly visualized reports in custom dashboards. The aim of these features is to help identify and address an organization’s weak points. This is where the similarities end. Business analytics software is used to explore and analyze historical and current data. It utilizes statistical analysis, data mining and quantitative analysis to identify past business trends. Once data has been collected and analyzed, Business intelligence analytics systems then use that data for predictive modeling. This can predict and, in most cases, prepare for future business climates. One of the most powerful aspects of BA is ad-hoc reporting, which allows companies to perform analysis of specified data in real-time to answer targeted questions to make quicker business decisions. In effect, business analytics uses predictive analysis to solve problems before they’ve occurred. A business analytics dashboard from Sisense. Popular business analytics solutions include: SAP Business Analytics Suite, Pentaho BA, Birst BI and Tableau Big Data Analytics. Organizations are beginning to see that data and content should not be considered separate aspects of information management, but instead managed in an integrated enterprise approach. Many companies are moving towards operational business intelligence which is currently under-served and uncontested by vendors. While superficially similar, the difference between BI and BA is clear once you do a little digging. BI uses past and current data to optimize the present for current success. BA uses the past and analyzes the present to prepare companies for the future. Traditionally, business intelligence vendors targeted mostly enterprises, but now there is a paradigm shift of BI moving to small businesses and mid-sized organizations. Self-service BI is a major focus of these smaller companies. Self-service business intelligence (SSBI) is an approach to data analysis that enables users to access and work with corporate data even though they do not have a background in analytics or data science. It typically features a more user-friendly UI and doesn’t involve coding, so your regular joe can operate it. Choosing the solution for your business depends on your intentions. If you are satisfied with your business model as a whole and mainly wish to improve operations, increase efficiency and meet organizational goals, business intelligence may be an optimal solution. In particular, companies that rely on real-time reporting tend to lean toward BI as they are concerned with what they can improve in the here and now. On the other hand, if you intend to change your business processes — or even your entire business model — but don’t yet have the necessary insights, business analytics might be the best option. Companies that require extensive data (e.g. the need for data warehousing) and intuitive reporting should seriously consider business intelligence. BI has the added advantages of targeting a business’ weak areas and providing actionable insights to those problems. Business intelligence tools are excellent solutions for managers who want to improve decision making and understand their organization’s productivity, work processes and employees. Then, with that understanding, improve their business from the ground up. If your business is fairly new or in the midst of significant changes, business analytics software deserves your serious consideration. Business analytics solutions use historical data, current information and projected trends to ensure your business makes the right changes. BI analytics is the solution if you want to analyze your company, your market and your industry with the dual goals of optimizing current performance and predicting business trends to help you remain competitive in the future. When comparing business analytics vs business intelligence, It may feel overwhelming to select the correct system, but don’t worry. There are simple ways to determine the best option, and they come down to what you prioritize in your decision-making process: current improvements or future planning. Most companies want a combination of current success and future preparation. Alone or together, business analytics and business intelligence solutions can help you take your business where you want it to go. What do you think about our analysis? 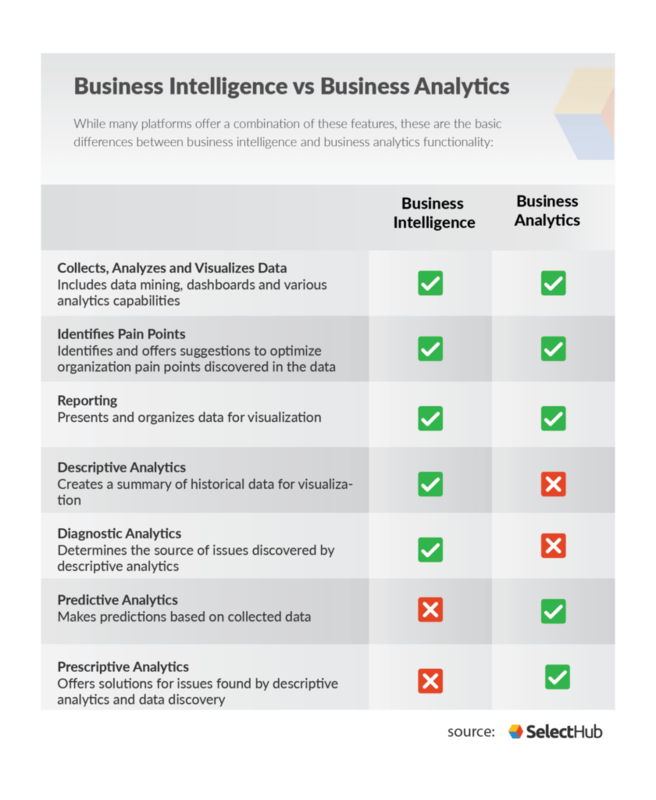 Did we miss anything important about BI and analytics? Let us know in the comments! Great post. Business intelligence and analytics plays there own important role in the success of an organisation. BI is the knowledge and BA is how we act based on the knowledge. Thanks for sharing this. Can we say BA is advanced BI? That’s definitely one school of thought! There isn’t an industry-wide standard for whether BA or BI is the originator of the other, but SelectHub categorizes BA as a subset of BI. I wouldn’t call BA advanced BI per se: it’s more an additional set of features that BI offers that are more future-focused. This definitely used to be an advanced option, but it’s becoming the norm in business intelligence tools. This is the best post I’ve read about that subject!